The cardiovascular system includes the heart (cardio) and blood vessels (vascular). The heart pumps blood throughout the body. Sixty thousand miles of blood vessels transport the blood, enough to encircle Earth more than twice. Arteries carry blood away from the heart; capillaries reach all of the body's seventy trillion cells; and veins carry blood back to the heart. Because blood vessels form a circular route, this system is also called the circulatory system. The cardiovascular system has two main parts. In the pulmonary circuit, blood is pumped from the right ventricle of the heart through the pulmonary arteries, which lead to the lungs. Here the blood gives up carbon dioxide and picks up oxygen. The oxygen-rich blood returns to the left atrium of the heart through pulmonary veins. From the left atrium, blood passes to the left ventricle of the heart, which pushes the blood through the systemic circuit beginning with the aorta, which branches to all body parts. 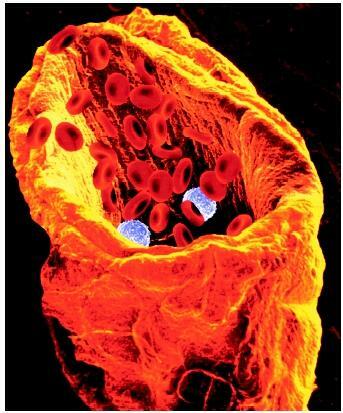 A scanning electron micrograph of red and white blood cells flowing through a vein. After delivering oxygen and picking up carbon dioxide, blood returns to the right atrium of the heart and then to the right ventricle. The journey begins anew. Thick walls enable arteries to withstand the pressure created by the pumping of the heart (blood pressure). The pulmonary arteries and the aorta are the largest arteries (the aorta is as wide as a thumb!). Some arteries are named for the organ that they supply, such as the hepatic artery (liver) and the coronary arteries (heart). Others have special names, such as the carotid arteries that supply the head and brain. Arteries branch many times into smaller arteries and eventually into minute branches called arterioles. Arteries consist of an inner lining, one cell thick, called endothelium, a middle layer of smooth muscle and elastic tissue, and an outer layer that is mostly loose connective tissue , which holds the multilayered tube together. The muscle layer in arteries and arterioles is thick and the overall structure quite elastic, enabling these vessels to withstand greater blood pressure than can veins. Veins and arteries are so similar that portions of veins are used to replace damaged arteries in coronary artery bypass surgery. Veins have the same three layers as arteries and are elastic, but they have a less-muscular middle layer, making their walls thinner. Also, unlike arteries, some veins have valves (tissue flaps) that permit blood to flow in only one direction, back to the heart. Valves help maintain blood flow in places such as the legs where the blood pressure has to push blood uphill, against the force of gravity. Despite the valves, accumulation of blood in leg veins can stretch the thin walls, resulting in varicose veins. Veins are named in much the same way as arteries. Pulmonary veins return blood from the lungs to the heart, and a hepatic vein returns blood from the liver. Some veins have special names. The jugular veins return blood from the head, and the great saphenous veins return blood from the legs; these are used as grafts in coronary artery bypass surgery. The median cubital vein, which extends from side to side in the bend of the elbow, is a common site for drawing blood. The smallest veins arise from minute venules, and then merge to form larger and larger veins. Capillaries are the shortest, narrowest, and thinnest blood vessels. They connect arterioles to venules to complete the circuit. Capillaries consist only of endothelium with some connective tissue binding the cells. Red blood cells squeeze through capillaries single file. Unlike arteries and veins, capillaries do not have specific names, but are named collectively for the region that they supply. Capillaries in the lungs, for example, are called pulmonary capillaries, and those in the stomach are the gastric capillaries. The body will always have one heart, but the number of blood vessels may change. Because blood vessels bring oxygen-rich blood to cells, areas that have increased oxygen demands actually develop more blood vessels, primarily capillaries. New blood vessel growth is called angiogenesis. For example, new capillaries permeate the muscles of a conditioned athlete. Cancerous tumors also grow new capillary networks. One approach to fight cancer is to starve it with drugs that block angiogenesis. Lewis, Ricki. "Homing in on Homocysteine." The Scientist 14 (2000): 1. Shier, D., J. Butler, and R. Lewis. Hole's Human Anatomy and Physiology, 8th ed. Dubuque, IA: McGraw-Hill Higher Education, 2000.